Painted plaster sculpture w/ wood, other materials in painted wood box. 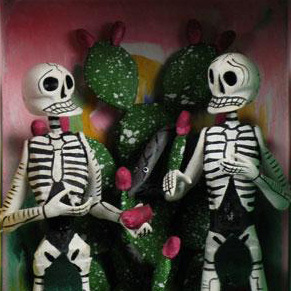 Note: Due to their fragility we can no longer ship these retablos out of the U.S. except by special arrangement. Custom art-handler packing and shipping required. Please inquire for estimate. (10 3/4" x 6 3/4" plate size on 25 1/4" x 15 1/2" sheet), #83/150, n.d. Painted carved maguey wood sculpture in painted wood box. Exact designs will vary. Painted carved maguey wood sculpture in painted wood box. Musicians shown may vary. Painted plaster sculpture in wood box (colors and specific design may vary).